The colorful Carlsbad spread is only open a few weeks each year. The Flower Fields of Carlsbad is full of high-level color in the spring. Want to see it? It opens on March 1, but check in to see when the bloom is at its best. THOUSANDS UPON THOUSANDS OF FLOWERS, all in pink and yellow and red and white bloom at the agricultural attraction. As is tradition, The Flower Fields will open on March 1, and, as is tradition, the final day of the 2017 season will be Mother's Day, or Sunday, May 14. Note that the flowers aren't in bloom for the full stretch, so you'll want to keep an eye on the Facebook page to see how the fields are doing. 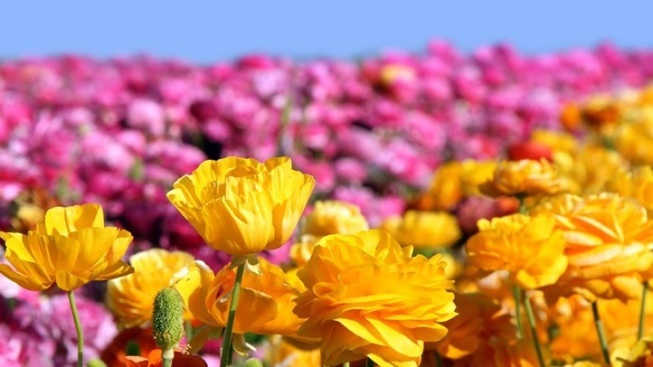 There are "over 50 acres" to take in of Giant Tecolote Ranunculus splendor, and some of that splendor will be available for sale. "A portion of the flower crop is sold as cut flowers," says the Flower Fields site, meaning you may soon have a few bright blooms for your kitchen table. But will the neighbors know what the unusual, incredibly vibrant flowers are? Probably, if they're into petals, lots of color, and a California springtime-traditional sight.